(People's Daily Online) Public opposes Xiamen chemical plant. May 30, 2007. Experts and the public have expressed strong concern over the possible environmental impact of the construction of a massive chemical plant in Xiamen, East China's Fujian Province, Outlook Weekly reported yesterday. The Taiwan-funded Xianglu Group has begun building the plant, which will have an annual output of 800,000 tons of p-Xylene, in the Haicang District of the city. The project has stirred huge controversy due to its location, just 7 km from the city center and only 1.5 km from the nearest residential area. Zhao Yufen, an academician with the Chinese Academy of Sciences, has proposed the plant be relocated to avoid the possible threat of pollution in the future. Led by Zhao, who is also a member of the Chinese People's Political Consultative Conference (CPPCC), the country's top political advisory body, 105 political advisors submitted a suggestion during the annual session of the CPPCC in March asking for the plant to be relocated. "It is against international conventions to build such a large-scale chemical plant so close to a residential area," Zhao said, adding that it would normally be located at least 100 km from the nearest urban area for safety reasons. "P-Xylene is highly toxic and carcinogenic", Zhao said. Despite people's concerns, the local environment bureau told local media on Monday that the project had passed an environmental pre-evaluation test, as its pollutant discharge level was just half the national standard. "But whatever preventive measures are taken, there is always the possibility of an accident happening," Zhao said, citing a chemical plant blast in 2005 in Jilin, Jilin Province, which led to about 100 tons of toxic benzene compounds being spilled into the river. "We are not against the project, but just say its location should be changed," Zhao said. Xiamen is a coastal city known for its pleasant climate and clean environment. It is not suitable for a large-scale chemical plant, she said. In an interview with China Business News, Zhao said that economic considerations might be behind the support from the local government. "The project and its second phase are expected to add 80 billion yuan to Xiamen's GDP, which would be hard to resist for a city that posted figures of 112 billion yuan for the whole of last year," she said. (Reuters) China city suspends chemical plant after uproar . By Chris Buckley. May 30, 2007. Debate over the plant began to grow during the annual session of China's parliament, when 105 members of the Chinese People's Political Consultative Conference – a usually sleepy talkshop – raised doubts about the project, estimated to cost 10.8 billion yuan ($1.4 billion). ... A prominent Xiamen scientist who has led opposition to the plant, Zhao Yufen, complained in newspapers she was not shown an environmental impact study that city officials said had cleared the project. She argued the plant should be moved to a less populous place. (The Sun) Anti-PX Scholar Under Pressure; Changes Direction To Support Suspension of Construction. June 3, 2007. "The brief announcement of Zhao Yufen" pointed out that Zhao Yufen has never been interviewed and never authorized any media to express her opinions concerning the Xiamen PX project. Zhao believed that the fact that the Xiamen city government has decided to suspend construction of the PX project and re-assess the environment impact showed that the city party and government respect science, public opinion and environmental protection. The announcement used the same language as the statement from the city government to the public on the day before yesterday. At the <Xiamen Daily> website, some commentators wrote that Zhao "had no real ability and learning," that she knew little about environmental protection, that she was manufacturing rumors to mislead the public and that she "was deliberately trying to ruin the image of Xiamen." But at the Xiamen University website, some students defended her as being kindly, learned as well as the savior of Xiamen that the citizens should be grateful to. So who is Zhao Yufen? How did she get to be where she is? Where was she during the Cultural Revolution? Etc. (People.com.cn) Zhao Yufen: Two Hometowns, Same Deep Love. July 21, 2006. In the familiar Taiwanese song <Olive Tree>, there is this refrain: "Do not ask me where I come from, my hometown is faraway ..." When I met Chinese Academy of Sciences member professor Zhao Yufen, I recalled this moving song. Zhao Yufen was born in mainland China in 1948. In 1949, she was brought to Taiwan by her parents. Her hometown was Qixian in Henan province. She said that when she was small, her mother told her about the clear Qi river and the dense willow trees on the river banks in her hometown. There was also her maternal grandparents whom she had never met. The young Zhao Yufen had a wish: someday, she will go to Qixian (Henan) to visit her maternal grandparents. In 1971, she graduated from Taiwan's Tsinghua University and she was then accepted as a graduate student at the Department of Chemistry at the State University of New York at Stony Brook (USA). When she got the acceptance letter, she had a problem because she did not have enough money to purchase a plane ticket. Someone gave her the suggestion that she borrowed money from the airline by using her university scholarship as proof and repay with US$30 per month by installment. Before she left, her mother told her in tears: "Your mother has brought you up for more than twenty years. You won't be coming back after you leave this time? She comforted her mother by saying: "I will definitely come back." Yet, life is full of unpredictable things. In 1978, she went from the United States to visit her maternal grandparents in Qixian, Henan. For this, the Taiwan authorities forbade her to return to Taiwan. "My hometown is faraway" became a way for Zhao Yufen to think about her mother. In 1996, Zhao Yufen finally went back to Taiwan twenty-five years after she left. By this time, her mother had passed away. That farewell in 1971 was the last time that they were with each other. When Zhao Yufen first arrived in the United States, professor C.N. Yang had just returned to the State University of New York at Stony Brook to make a speech about China. He presented the situation in China and spoke about the Chinese scientists and the research work that they were doing. He also spoke about the latest archaeological discoveries and showed a recently found bronze mirror. With the improvement of Sino-American relationships, a group of Chinese scientists visited the United States. When they arrived at the State University of New York at Stony Brook, Zhao Yufen presented flowers to the Chinese biologist Bei Shizhang on behalf of the overseas students from Taiwan. Searching for several years, Zhao Yufen finally located her maternal grandparents in Qixian (Henan. That summer, Zhao Yufen finally returned to the hometown that she could only dream about before. Her 90-something-year-old maternal grandfather was scholar (Xiucai) of the Qing dynasty and immediately did some calligraphy upon her return. In remembering the occasion, Zhao Yufen said: "I suddenly felt very real. When I was in Taiwan, I was very uncertain about where I came from or who my ancestors were. When one does not have roots, one floats!" This trip to her hometown changed her personal trajectory in life. She visited the chemistry research organizations in Beijing, Shanghai and Tianjin and saw that many things are feasible. When Chinese Academy of Sciences Institute of Chemistry director Liu Dagang learned that Zhao Yufen had a doctorate in chemistry from the State University of New York at Stony Brook and was doing post-doctoral research at New York University, he told her warmly: "We welcome you to come here and work." In 1979, Zhao Yufen said farewell to her post-doctoral advisor professor Shapiro at New York University and became a researcher at the Chinese Academy of Sciences' Institute of Chemistry. 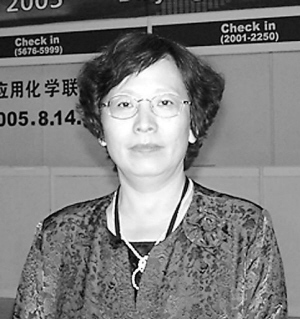 In 1988, she was appointed professor at Tsinghua University (Beijing). In 1991, she was elected as member of the Chinese Academy of Sciences, becoming its youngest female member at the time. In 2000, she moved to Xiamen (Fujian) because she missed the warm, moist weather of Taiwan. At Xiamen University, she is a professor in the School of Chemistry and Chemical Engineering.